As an honorarium to assassinated President John F. Kennedy, the Kennedy Half Dollar was designed, approved and put into circulation in less than 3 months after his death. Within hours of his death, then current Mint Director Eva Adams contacted Chief Engraver Gilroy Roberts to inform him that serious consideration was being given to putting Kennedy on one of the large silver coins. After consultation with Jacqueline Kennedy, the half dollar was selected and the production of the Kennedy Half Dollar was approved. 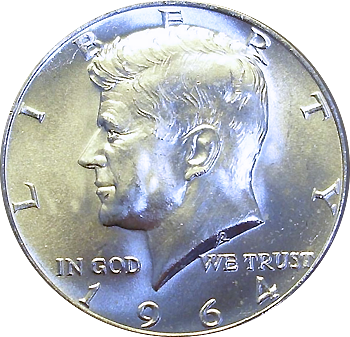 Since the obverse was simply a modified design of the Kennedy Medal, only the reverse was necessary to design. With minor modifications from the trial strikes in December, 1963, the coin was approved by Jacqueline and Robert Kennedy and was endorsed by new President Lyndon B. Johnson on December 10th. Congressional legislation approving the new coin was passed on December 30th, 1963. Production officially began on January 30, 1964 and continues today. Although the Kennedy Half Dollar has always been 31 millimeters with a reeded edge, the 1964 and 1964-S minting of the Kennedy Half Dollar adhered to the 90% silver/10% copper used in all silver coins at the time which made the coin weigh in at 12.5 grams. Due to the popularity and collectability of the Kennedy Half Dollar, not only were few coins ever in circulation, but the hoarding led to an increase in the price of silver. This led to the Coinage Act of 1965 which changed the coin consistency to an 80% silver/20% copper clad over a 79% copper/21% silver core which dropped the weight to 11.5 grams. When this failed to increase the percentage of Kennedy Half Dollars in circulation, the Treasury Department sought to remove all silver from the half dollar. President Richard Nixon signed the legislation into law in December, 1970. This led to the formulation of the Kennedy Half Dollar to now be 75% Copper/25% Nickel over a 100% Copper core which changed the weight to 11.3 grams. Since the Kennedy Half Dollar was rarely seen in circulation, banks had eliminated the half dollar slot in drawers and machines. This led to a surplus of the new base metal half dollars because no banks were willing to circulate them. 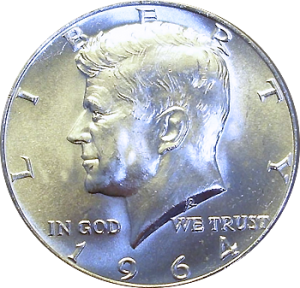 Although there were around 425 million 1964 Kennedy Half Dollars minted and well over 860 million minted from 1965 through 1970, many of these have been melted down for their silver content. In 1975 and 1976, the U.S. Mint struck the Kennedy Half Dollar with a different reverse depicting Independence Hall honoring America’s Bicentennial. Starting in 1992, the U.S. Mint has issued a certain amount of Kennedy Half Dollars in 90% silver for Silver Mint Sets and from 2005 through 2010, Kennedy Half Dollars included in Mint Sets had a matte finish to differentiate them from coins sold in bags and rolls.